1 In a pot, bring 400 ml (approximately 1 3/4 cups) vegetable broth to a boil. Peel garlic and squeeze through a press directly into pot. Add rice, cover and cook for 25 minutes over low heat. 2 Meanwhile, rinse and peel carrots and kohlrabi. Cut kohlrabi into eighths. Cut carrots and kohlrabi pieces into slices about 5 mm (approximately 1/4 inch). 3 Rinse broccoli, trim and cut into florets. Peel stems and cut them into about 5 mm (approximately 1/4-inch) thick slices. 4 Boil remaining vegetable broth in a second pot. Add carrots and kohlrabi and cook for 2 minutes. Then add the broccoli florets and slices and cook 4-5 minutes longer. 5 Drain the vegetables in a sieve, taking care to collect the broth in a bowl. 6 Add the cooked rice to a shallow baking dish (about 1.5 liters) (approximately 6 3/4 cup capacity) and smooth out with a spoon. Add vegetables and spread out evenly. 7 Add the eggs to the collected broth and whisk with a fork. Season with salt, pepper and grated nutmeg. 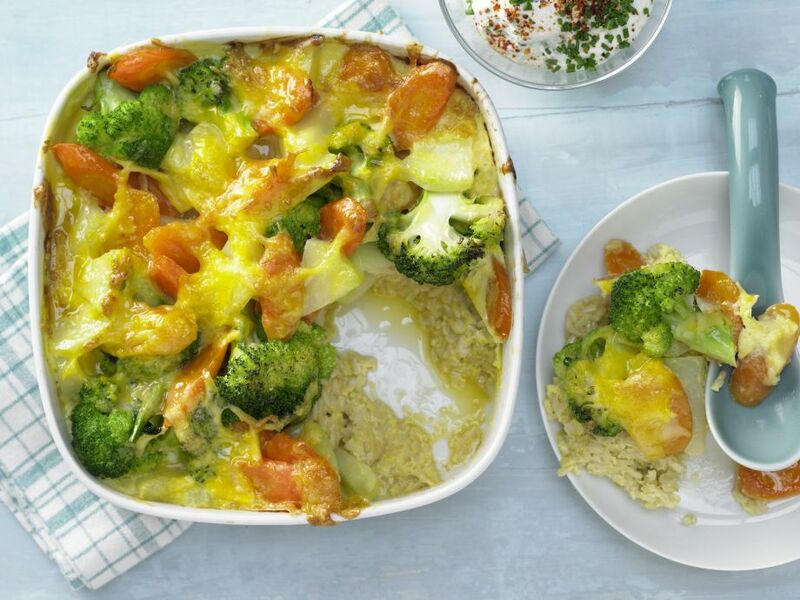 8 Pour the liquid over the vegetables in the baking dish, sprinkle with grated cheese and bake in preheated oven at 200°C (fan oven 180°C, gas mark 3) (approximately 400°F/convection 350°F) for about 35 minutes. 9 Meanwhile, rinse the chives, shake dry and cut into small rings. Mix yogurt with chopped chives. Season with salt and paprika and serve with the casserole.